In October 1923, an “unknown donor” offered what eventually became $250,000 to build a community center in Moorestown. The unknown donor was Eldridge Reeves Johnson. Born in Wilmington, Delaware in 1867, he attended the Spring Garden Institute in Philadelphia then apprenticed in a machine shop in the city. His first business was a machine shop in Camden. His first product was an automatic bookbinder. The “fever” expressed itself in innovations improving the recording process and the Victrola itself. In 1901, Johnson formed a new corporation – the Victor Talking Machine Company. He and his new corporate partners felt they needed a special trademark for their products. That trademark became known around the world. It was a dog, a fox terrier, with its head tilted toward a gramophone and a caption that read “His Master’s Voice”. Twenty-five years later, Victor Talking Machine Company had expanded from its small one-story shop to become one of New Jersey’s premier industries occupying six city blocks in Camden. In 1926, Johnson sold his interests in the company to Radio Corporation of America for a reported 40 million dollars. His home on Moorestown’s Main Street was called “The Towers”. Originally the home of Samuel Allen (inventor of the Flexible Flyer sled), it is now the Lutheran Home. 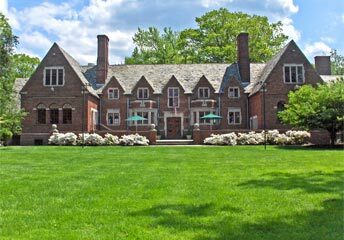 In 1923, while living in “The Towers”, Johnson was approached by Mabel d’Olier of the Moorestown Woman’s Club. She was looking for land and financing to build a community center. Mr. Johnson agreed to donate the funds necessary to build the facility if the people in town would show their interest by creating a “permanent maintenance fund” for building operations. Within eight months, more than $106,000 was raised in a town-wide fund drive. Donations came from 740 individuals, 500 school children, and dozens of local civic and fraternal organizations. At the time, it was felt that the income from an endowment fund of $117,000 would be adequate to cover three-quarters of the facility’s projected $8,000 annual operating budget. The site for the new Community House would be right in the center of town, on a three- acre property owned by Mary Sumner on East Main Street. The house on the property was one of the oldest in Moorestown, dating back to about 1786. It was originally a summer residence for a Philadelphia businessman and his family. Along with a barn and a pig pen, the grounds featured a formal English garden with flowering shrubs and low-cut boxwood bushes. In December 1924, the Sumner Home was demolished and construction of the Community House began. 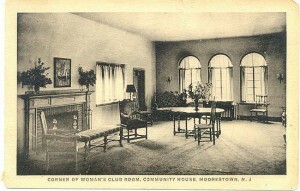 The Community House officially opened its doors to the public on April 11, 1926, with a week-long series of events including Community Players Night with selections by the Moorestown Orchestra, a Teenage Tea for the girls of Moorestown, a concert by the Moorestown Community Chorus, and an exhibition match by the University of Pennsylvania Wrestling Team. In 1931, the building was enlarged to provide additional meeting space. The first floor area was remodeled in 1993 to allow disabled individuals access to the meeting rooms. In 2008 the gymnasium was converted into an elegant ballroom. The Garden Room was extensively refurbished in 2011. The main lobby area was remodeled in 2013.